Nobel Peace Prize-President quietly opens 8th US battlefront. 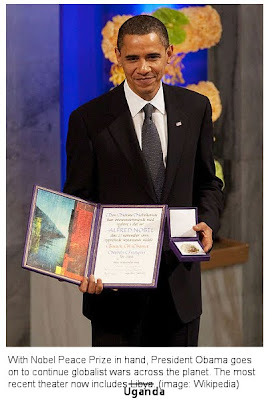 While America occupies Iraq and Afghanistan, wages covert war on Pakistan, conducts drone attacks on Yemen and Somalia, bombards Libya, and positions for a wider confrontation with Iran and Syria, Nobel Peace Prize Laureate President Obama has now quietly, without much fanfare, sent 100 US troops to help Ugandan President Yoweri Museveni crush rebels threatening his 25 year dictatorship. In what is essentially a "reverse-Libyan-style" intervention, the US is sending troops to crush, not assist rebels rising up against their despotic ruler. Ironically, just as with Libya's rebels, Uganda's rebels are also listed as a foreign terrorist organization by the US State Department. Instead of the corporate-financier contrived International Criminal Court issuing fictitious warrants for Uganda's head of state, as was done with Qaddafi in Libya, it is the Ugandan rebel leader, Joseph Kony, who is being targeted. Both the Ugandan government (with US assistance) and the rebels, known as the Lord's Resistance Army (LRA), are accused of perpetrating heinous atrocities against their enemies and civilian populations in their decades long conflict. In particular, Ugandan President Yoweri Museveni has just recently presided over the mass murdering and displacement of 20,000 of his own people on behalf of British corporations who sought to construct tree plantations on their land. US and British military assistance and business deals with the Ugandan government have been a ubiquitous feature throughout Museveni's perpetual, unending term as president. While mutilated victims of the LRA are just now being paraded in front of the public to frame the recent US troop deployment as another "humanitarian intervention," it is more than likely that geopolitical aspirations, not humanitarian concerns, are driving this agenda. This is especially so considering just how equally abhorrent the Ugandan government's human rights record is. The LRA has often been harbored by the Sudanese government (now the South Sudanese government). Sudan has served as a proxy battlefield between the West and China for control over of its vast oil holdings and ultimately as part of a greater battle to control Africa's resources. Sudan appears to have used the LRA as a sort of armed buffer between them and their neighbors, in particular, Uganda, ruled by an eager servant of the Anglo-American agenda. Surely, as Africa, a forsaken continent, is already written off in the minds of many Americans, little concern and few eyebrow will be lifted as their Nobel Peace Prize-wearing president sends yet more troops off to war there, in a global military expansion quickly and alarmingly approaching the scale and scope of Adolf Hitler's expansion across Europe and Northern Africa during World War II. This is difficult to deny when the final tally is done - the United States is conducting either covert or overt military operations in at least 8 nations - Iraq, Afghanistan, Yemen, Somalia, Iran, Libya, Pakistan, and now Uganda - and has 820 military installations in at least 135 countries. As Wall Street and London seek global hegemony, the price Americans pay as this tally grows will only increase. However far flung Uganda may seem, every inch of expansion by the globalists is one inch less for free humanity. Identify the corporate-financier interests engineering and driving this agenda, boycott and replace them.